As in most of the USA, there are many Mexican people living here. Below is the Wikipedia explanation of the holiday. Along the waterfront of Portland there is a large tented area where people are celebrating. The photo is from the main stage. 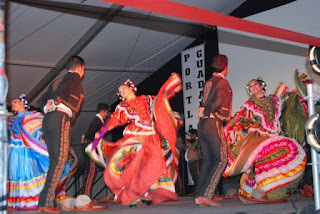 Cinco de Mayo (Spanish for "fifth of May") is a regional holiday in Mexico, primarily celebrated in the state of Puebla, with some limited recognition in other parts of Mexico. The holiday commemorates the Mexican army's unlikely victory over French forces at the Battle of Puebla on May 5, 1862, under the leadership of Mexican General Ignacio Zaragoza Seguín. The outnumbered Mexicans defeated a much better-equipped French army that had not been defeated in almost 50 years. Cinco de Mayo is not "an obligatory federal holiday" in Mexico, but rather a holiday that can be observed voluntarily. While Cinco de Mayo has limited significance nationwide in Mexico, the date is observed in the United States and other locations around the world as a celebration of Mexican heritage and pride. A common misconception in the United States is that Cinco de Mayo is Mexico's Independence Day, which actually is September 16 (dieciséis de septiembre in Spanish), the most important national patriotic holiday in Mexico.